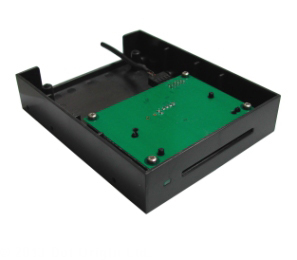 The 3921 USB floppy-bay reader from Omnikey (previously the CardMan CM3921) offers the very latest technology in a housing that can be integrated into most PC cases. This reader is fully PC/SC and EMV Level 1 compliant and supports all ISO 7816 microprocessor-based smartcards as well as a variety of popular memory cards. It also meets USB 2.0 and CCID specifications for simple driver installation. The reader is based on the same electronics as the popular 3121 desktop reader, and comes complete with WHQL approved Windows drivers, as well as support for other operating systems such as Linux, and is ideal for all smartcard applications where a built-in card slot is preferred. This version comes with an internal USB cable designed to connect directly to the PC motherboard. If you are unsure whether you have a spare USB header available, we recommend the CM3921 Retail Pack, which includes both internal and external USB cables. The CardMan 3921 is the latest addition to the Omnikey range of leading smartcard readers and boasts both great performance and quality.